I was watching the Vuelta online this morning. Listening to the coverage on Eurosport, when the announcers began to talk about how the area around Malaga is great for riding a bike. Many of the Spanish professional cyclists train in the area. They were commenting on how different areas become trendy for pros to live and train. In the early 1990s Italy was popular, then the south of France and the area near Nice was popular until road traffic became too much. A few cyclists gathered in Girona, Spain in the mid 2000's, and then more came and a reputation grew. 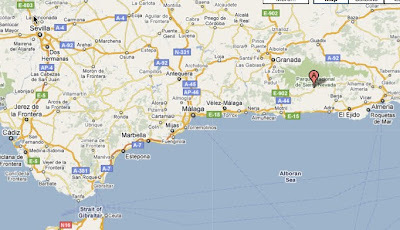 Now Malaga, Spain is growing in popularity. For those of us who enjoy traveling with a bike and experiencing new roads and new adventures, it is always nice when someone blazes the trail first and makes recommendations. I was curious about the area. I've never ridden in the area before, so I started to read about it. I'm not quite sold. It looks like there could be plenty of mountain biking and road cycling. But I also read of busy roads, tunnels, dry heat, questionable drivers, and lots of hills. Sounds like most cycling areas. An area that might be great for a pro riders, but maybe not as good for standard riders. I do however have very fond memories of being a tourist in Sevilla and Granada. Tapas, and wine, and evening music in the cafes. It might be more fun, simply to keep watching the Vuelta online. Today Philippe Gilbert won Stage 3 of the Vuelta a España that finished in Malaga, Spain.